Today I had to share 13 GB with ~10 people, and I had to do it quickly. I thought of many options - ftp (it would take a while), usb flash drive - even worse. I thought of the P2P capabilities of the torrent technology. How hard can it be? There aren't many options, the defaults are good enough. 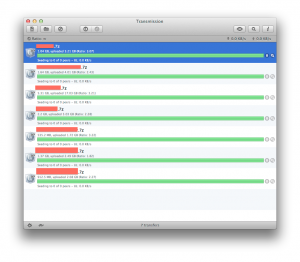 To share the torrents initially I used Transmission. uTorrent for some reason refused to share the files or it was too slow, I don't know. 13 Gb transmitted to ~10 people in a 100mbit LAN network in less than an hour. And my machine didn't take that much of a performance hit. I worked during that time. NOTE: creating the torrents as private somehow made sharing faster. I don't know why. But it did. You people are working very well...thumbs up to you.